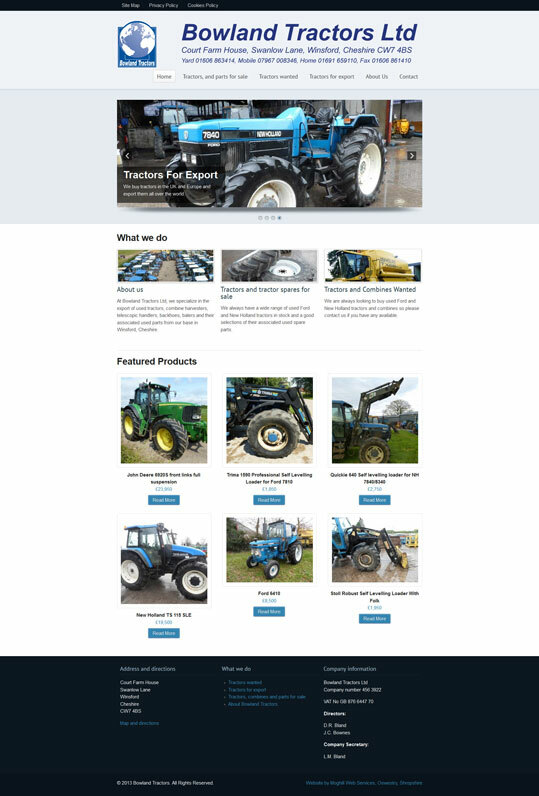 Bowland Tractors specialise in exporting used tractors and agricultural vehicles of all kinds existing website was dated and did not present the business in the best light. They wanted a website that users with basic knowledge of computers could use with ease. We brought a professional approach to the new website, and built an entirely new version. We re-structured the site with new content focused better towards customers’ needs and the needs of the business. The heart of the site is an online brochure that allows customers to see parts and spares, instead of the product pages it used before, which were difficult to use. The new system is also a lot easier for Bowland Tractors’ staff to update themselves, and we included training and access to the Moghill Help site, which includes guides and video tutorials. Bowland Tractors Director David Bland said: “Our old web page had become outdated and ineffective so we received a few quotations to update it from local and national companies. “Moghill stood out as they clearly explained the process, costing and the fresh ideas they had for our new site. With minimum input from us the site was built and was up and running in the agreed time scale.